Leftover Tarragon? How many times have you purchased a package or bunch of herbs for a recipe only to use a small part before going bad. 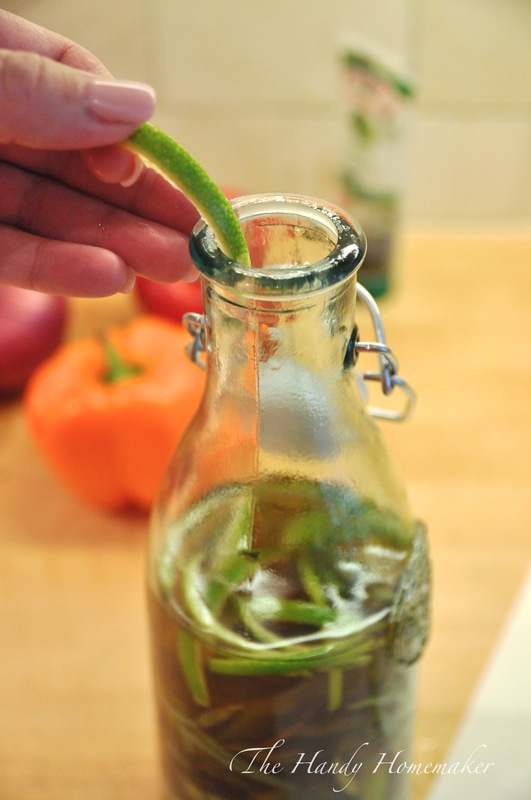 Next time before this happens, make an herb infused vinegar. What do I do with Tarragon Vinegar you ask? A few uses for this vinegar is in making béarnaise sauce, or in salad dressing for a potato salad, (whisk 3 – 4 tbsp’s into a half cup of mayonnaise). Drizzle with olive oil over chicken, tomatoes, olives, and fresh mozzarella, drizzle with olive oil and serve with crusty bread, over fresh-cut tomatoes and cucumber, or make a simple salad dressing by mixing with olive oil and a touch of honey or maple syrup. Add a splash to soups, drizzle over roasted vegetables, or use in a marinade. 2 cups of champagne, white wine or apple cider vinegar or a combination. Sterilize the jar in a pot of boiling water for 10 minutes and let dry. Rinse the tarragon and remove any dead leaves. Pat dry and place in the jar stems and all. Gently bruise the herbs using the end of a wooden spoon in the jar. Add lemon or lime rind or garlic for extra flavour kick. Pour the vinegar over the top of the herbs until covered. Let steep in a cool dark place for 1-2 weeks until tarragon is infused into the vinegar. I store in the refrigerator after this. Other herbs that are great to mix with vinegar are thyme, lemon thyme, rosemary, basil, and dill. Dill vinegar is delicious served over fish or drizzled over a simple salad topped with blackened fish like salmon.